Come escape the stresses of everyday life at this quaint 2-bedroom, 2-bathroom cabin in a beautiful wooded setting. Once a central hub for the region's mining operations, Placerville, California boasts a tremendous amount of history from the gold-rush days and peaks the interest of any visitor. With a variety of historic landmarks, old classic buildings, and museums, as well as a flourishing high-quality wine industry, it's easy to understand why Placerville appeals to so many visitors! There's enough room in the Cabin to accommodate up to 6 guests, so this home is an ideal size for a family or group of couples out for a relaxing getaway. You'll find the cabin's interior quite comfortable and inviting, complete with updated stainless steel appliances in the full kitchen, a cozy wood burning stove in the living area, and soothing wall colors. Everything you need to be as relaxed as possible during your stay is here, including a Jacuzzi bathtub in one of the bathrooms with views out to the woods. Step outside to the expansive deck - partially screened in, in front - to soak up the sunshine and enjoy the fantastic views of the forest and the middle fork of the Cosumnes River in the background, which you're welcome to swim or wade in. (Please note the water level of the river is being affected by the drought.) Venture down the walking path to explore the river itself, and then rinse off in the cabin's outdoor shower on your way back after going for a swim. All the ingredients for pure relaxation are here! 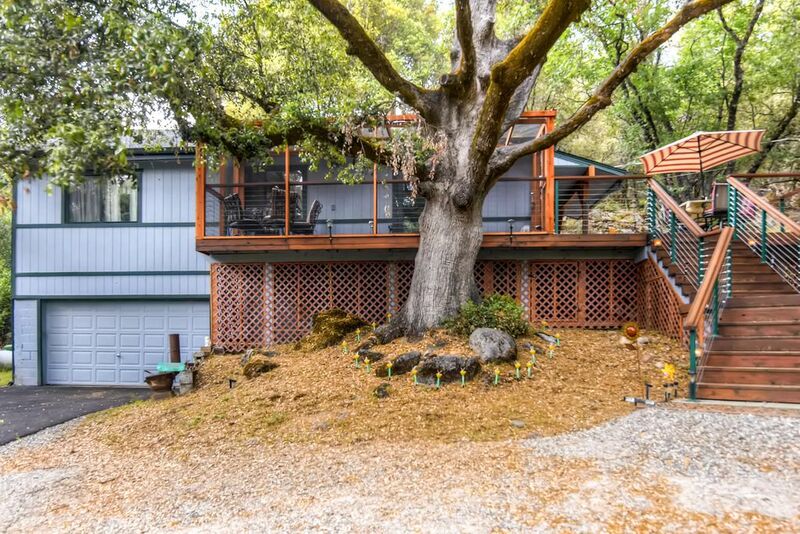 This cabin is in a great location to experience practically everything the area has to offer, including several outstanding wineries in El Dorado and Amador Counties. Take a tour of the Golf Bug Park & Mine for some history, or meander through Placerville's charming Main Street to observe its many historical markers that signify certain events or figures of importance during the gold-rush period. However you choose to spend your time during your vacation, this cabin is bound to become a place you love coming home to at the end of the day! This cottage is located near 20-plus wineries within 15 minutes of the home. Located at a comfortable 2100 ft elevation, this home is a year round destination. There are also skiing and riding at Kirkwood or Sierra-at-Tahoe which are about 45 miles away. Come stay at our wonderful home! - Great location by the Cosumnes River and within close proximity to wineries in El Dorado and Amador Counties! We rented this cabin for Passport Weekend. Quiet, peaceful location and the house had everything needed for a fantastic stay. We recommend this cabin to others and will definitely be back again soon. This was a magical experience, a week in this beautiful cabin. The cabin itself is gorgeous, very clean and extremely comfortable, especially the beds! The owners have thought of everything one might need except personal clothing and food. Dog blankets and dog towels were provided, I was continually in awe of how much was there for our comfort. I would have been happy staying there for months! My dogs and I hiked through the woods and surrounding forest, spent hours down at the river; I didn't desire to do anything else during our stay. We enjoyed the house. There was plenty of room. Absolutely the BEST place I’ve ever stayed at and I hope to return very very soon. Very cozy and comfortable, nice touches throughout the house and the best appliances I’ve seen in a rental thus far. Pet friendly and very very clean. Thank you so much!!! Highly recommended.